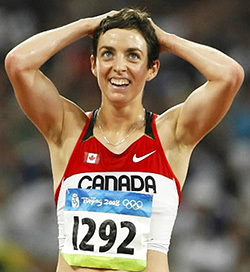 Running a Personal Best at the Beijing Olympics and qualifying for the final. You are never really playing an opponent. You are playing yourself, your own highest standards, and when you reach your limits,that is real joy. The CAN Fund is a very unique program set out to directly help Canadian Athletes achieve their dreams on their journey to the next Olympics. My name is Megan Wright and I am thrilled to be one of the elite Canadian Athletes to receive the $6,000 fund this year. This money will go directly to paying for travel to and from competitions as I prepare this year for the Commonwealth Games and get closer to London 2012. 15:11- 5000m, 4:10.28- 1500m. 2005 NCAA Champ, 2007 Pan American Champ, 2008 Olympic Finalist. I am a twin, the youngest of six kids whom are all great athletes. My one real superstition is that I like to eat Salmon the day before I race. I do not like having this superstition but every time I try to break it, I race terrible!